Heineken's Rugby World Cup sponsorship is underway, with leading rugby stars set to star in its TV campaign and upcoming giveaways to bring fans "closer to the action". The brand is kicking off the global campaign with a worldwide search for 48 fans to win the chance to open a match with an official coin toss. It will also roll out limited edition bottles and outdoor, print and digital and a TV ad that will break in August featuring rugby stars Jonah Lomu and John Smit. 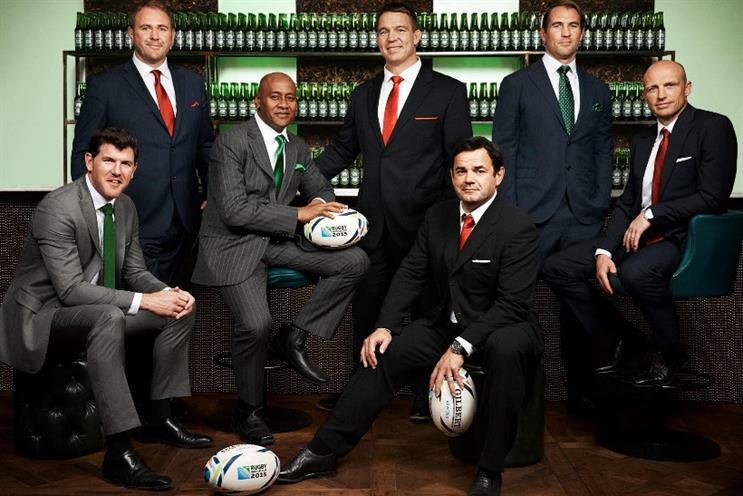 Heineken has signed former England captain Will Carling to the campaign, as well as Matt Dawson, Scott Quinnell, Rocky Elsom and Shane Horgan, who will take part in an online-only pundit panel throughout the tournament, called the Heineken Rugby Studio. The beer brand will also host live events in the UK, supporting this year's trophy tour and giving fans the opportunity to see the Webb Ellis Cup up close. David Lette, Heineken brand director said: "With this exclusive coin toss opportunity before every match, Heineken is proud to open Rugby World Cup 2015. We are proud to be rewarding passionate fans around the world with this unique, once-in-a-lifetime VIP experience to get closer to the action." Lette told Marketing that while Heineken has supported the Rugby World Cup for more than 20 years, this year the brand was ramping up activity. He said by "associating ourselves with world class experieces" such as music, football and rugby, the brand had become the number one premium beer brand. He said: "Rugby is a great sport to enjoy with a quality beer and we can also really drive our 'enjoy responsibly message' strongly around rugby. It's a fantastic platform to really engage and give people a fantastic experience." "Sports is one key, key element [in our marketing strategy]. It really is about world-class experiences, anything we can involve a fan with that really links to a great beer experience. "Watching live sports and bringing them to life is great way to interact with our target consumer - people who are open to challenging themselves, to go beyond just sitting on the sofa and people who have a sense of humour." He added for the "rugby markets" the World Cup was a "pinnacle" with 4bn viewers globally. In particular in the UK it was the brand's "big platform" for 2015, with activity having been mapped out for the past two years in order to bring a "different dimension" to its plans.